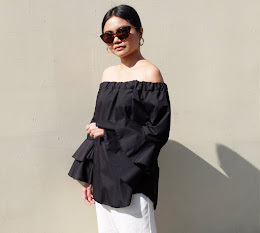 Featuring today three of my current favorite trends: cropped tops, asymmetrical skorts and ankle strap heels. If you're looking for basic turtleneck cropped tops like this, I suggest you head to your nearest Topshop branch. I bought mine a couple of days ago and I absolutely love the fit! It's incredibly comfy and perfect for the insane summer heat. I'm also wearing this skort from Zara, an advance birthday gift from my dear hubby. Topped off the look with my ankle strap heels from Forever 21.
simple yet stunning look! So on-trend! This my favorite look of yours! :) Love it! Wish a plump girl like me can rock that outfit too!